HONE, William. 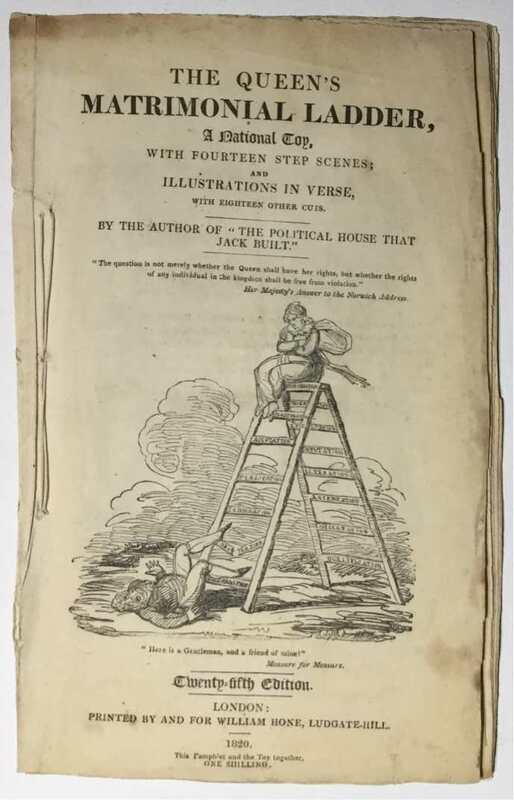 The Queen’s Matrimonial Ladder, A National Toy, With Fourteen Step Scenes: And Illustrations In Verse, With Eighteen Other Cuts.By The Author Of “The Political House That Jack Built”. 25th Edition, London. Printed By And For William Hone, Ludgate-Hill. 1820.The Pamphlet And The Toy Together One Shilling.Pp24 including cover wraps and last two pages advertisements. Approx 22cm x 13.5cm. Fore edges unevenly trimmed, some staining and dustiness, the odd corner folded and lacking, recently resewn. With the very uncommon ladder “toy”, folding printed pasteboard approx 15.1 cm x 6.3 cm, which matches the progress of Caroline of Brunswick’s unhappy marriage to King George IV. The “steps” of the marriage ladder according to Hone were ; Qualification, Declaration, Acceptation, Alteration, Imputation, Exculpation, Emigration, Remigration, Consternation, Accusation, Publication, Indignation,Coronation, and finally Degradation. The pamphlet is a little worn as usual, the ladder in Very Good plus condition. A previous owner has added ink names under the illustrations on pp 4 & 5. This is a wonderfully scurrilous pamphlet, describing a scandalous episode in British constitutional history which created a huge furore at the time, with great public support for Caroline’s cause. 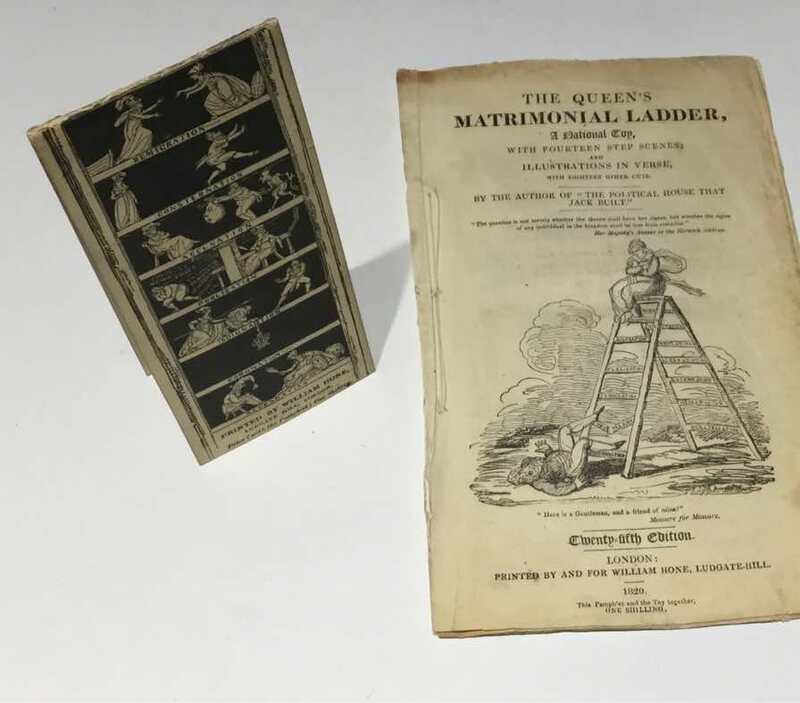 This is not an uncommon pamphlet, but the accompanying ladder is very hard to find in any condition.